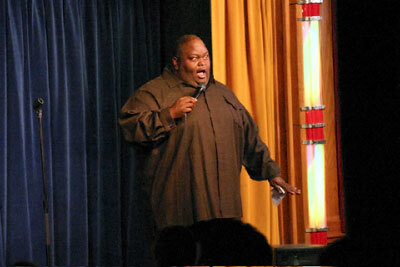 This week I spoke with the always endearing comic Lavell Crawford. He is an exceptionally large African-American comic that made his name on the road and BET before mainstream exposure on NBC's Last Comic Standing. We spoke about living in a skinny man's world, to be great is to have people remember your bits, and how he is just like Frank Sinatra. Andrew: How would you characterize your act? Lavell: My ideas are from personal experience. Talking about my family, myself, being a big guy in a skinny man's world. I never have low brow humor, but I never try to go over peoples' heads. I want them to enjoy and not have to pull out a dictionary to understand what the hell I'm talking about. Andrew: Because of your size do you feel an obligation to make jokes about it right from the start? Lavell: I'm sure there's bigger people in the world than me. I don't make it a big deal. I started talking about it because people are so small minded, so insecure about themselves. Andrew: Are you a comic that pens a joke first or do you go up with a premise and work out the punch-lines? Lavell: More or less a premise. Sometimes I'll mingle out with regular folk, talking, sharing ideas with them. If I get a chuckle then I'll try it out onstage. The best stuff is when it comes out fresh. Andrew: Do you have to change your act when you're in front of an black room versus an all white room or do you have an act that works in both places? Lavell: Well, I do things that work in both places. If I'm in a predominantly black club I'll probably be a bit looser, talk about more things that they can relate too. But most of the stuff I do in front of white audiences I do in front of black audiences or whoever because I'm thinking everybody goes through the same things that I go through. Andrew: Do you touch on politics in your act? Lavell: Politics is kind of touchy to some people. I'll talk about things I think are funny, but won't drag it out. Like the Madoff situation. I didn't really know about ponzi schemes cause being a brother everyone has a different word for ponzi. A con is a con no matter what word you put on it. But if you give your money to a guy named made-off, you're pretty dumb in the first place. Andrew: [laughs] What's the best piece of advice you were ever given in regards to stand up comedy? Lavell: I've dealt with a lot of people that I consider great. I had a great mentor who is a vaudevillian act named Danny O'day. We'd do nursing homes, VFW halls and they would cuss at me which was hilarious. He would always tell me, 'Look professional, wear a suit cause you're at work." Then Rudy Ray Moore, the great Dolemite told me 'Use everything you got.' You never ask how you did because the audience will always tell you exactly how you did. You always stay right and stay on that stage. Andrew: In your opinion what takes a good stand up comedian to the level of great? Andrew: How do you deal with the road? Lavell: It's a love hate relationship with the road. When me and my wife are getting along, I love to be with my wife, but when we fighting I love to be on the road. Andrew: [laughs] What did Last Comic Standing do for your career? Lavell: I did the grind before Last Comic Standing. I had done a lot of TV. I had made my name thanks to the Internet, being on the road and being funny all the time on the little shows to the point where I was getting the clubs to see I was viable. Then when I did Last Comic Standing, it took the money way up, that's a good thing. Andrew: Where are you going to be in fifty years? Lavell: I hope I have no plaque or cholesterol in my heart and I'm alive because I'll be old as hell, I'll be ninety. Hopefully my prostate isn't as big as a cantaloupe. If I'm still alive, I'll be proud because I did it my way like Frank Sinatra said. If I'm by myself I'll be a hermit fishing and feeding the wild grizzly bears in the woods. I'd like to be able to retire in my mid fifties, that's my plan. To be healthy and just see the world without always having to be on stage. I don't mind telling jokes, but I'd like to do it on my time like George Burns or Henny Youngman. Andrew: Can you talk about The Comedy & Magic Club, good or bad as a comedy club compared to others across the country? Lavell: There couldn't no bad about that club. It's got a great lineage. They have memorabilia from all the great movies and great comics. The owner, he LOVES the club. You have some places where club owners think they're doing the comics a favor by putting you on stage. He wants everyone to love the club the way he loves it. His energy is so natural and so hard to find nowadays. I like The Comedy & Magic Club and I hope the same flavor is there this time, like I did last time. I hope they stay open forever. I hate that I don't get to do it on a regular basis but every time that I get to do it, its always exciting. Some of the upper echelons of comedic talent have played through there. 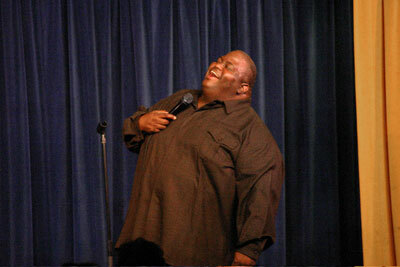 Lavell Crawford will be at The Comedy & Magic Club on Thursday, August 13th 2009. Reservations Required. (310) 372-1193 or comedyandmagicclub.com. ER.